April or “Earth Month” will be here soon. As always, Kids for Saving Earth is here to help you educate and empower your students to protect the Earth. This KSE E-Pal News highlights the issue of our Earth’s disappearing rainforests. Kids for Saving Earth helps support the Organization for Tropical Studies efforts in Costa Rica’s Braulio Carrillo National Park” and neighboring rainforest land. Almost every minute of every day, another acre of rainforest disappears forever. We may never learn about countless living treasures, all precious to the future of our planet. We need your support to educate your students to help us preserve these treasures today, for all generations to come. Step 1 Show this rainforest education video to your students. Go to http://www.supernaturaladventures.com/ Then click on Rainforest Explorer. Step 2 Print and discuss with your students the information in our new Rainforest Facts study sheet. Step 3 Ask your students to draw pictures of the rainforest, scan them in and email them to Kids for Saving Earth so that we can place them on our KSE Rainforest on-line bulletin board. 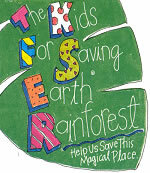 Create a rainforest bulletin board for your classroom also. Step 4 Click here to learn about our KSE rainforest protection program. Find an Earth-friendly way to earn funds to help support KSE’s efforts to protect rainforests. Click here to get some ideas. Step 5 Consider becoming an Amigos de La Selva to support and communicate with Costa Rican schools neighboring the rainforest areas you are helping to protect. Click here to learn how you can help buy school supplies and support such educational experiences as field trips into the La Salva and Braulio Carrillo National Park. The schools we are supporting are very poor and often the students and their families don’t understand the importance of protecting the rainforests that surround them. To save the rainforests, the members of each local community need to work to protect them. One of the most important ways you can help Kids for Saving Earth is to forward this KSE E-Pal News to other educators. Tell them to go to www.kidsforsavingearth.org to sign up for their free or paid membership. Thanks to Soda Stream for funding the KSE E-Pal News. It’s the environmental and healthier way to drink soda pop!